Today is also the start of Stampin' Up's biggest sale of the year! Saleabration!! We love Saleabration because there are some great perks for both customers and demonstrators! 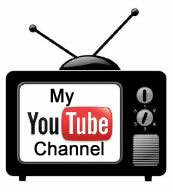 During Saleabration for every $50 in product you buy, you receive a free product of your choice! 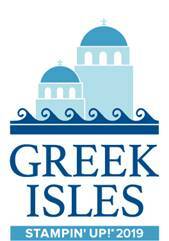 And this year - we have a new perk - for a $100 product purchase, you can select a bigger freebie! The Occasions catalog is brimming with so many wonderful new products!! One of my favorite suites of products is the Sweet Soiree Suite. 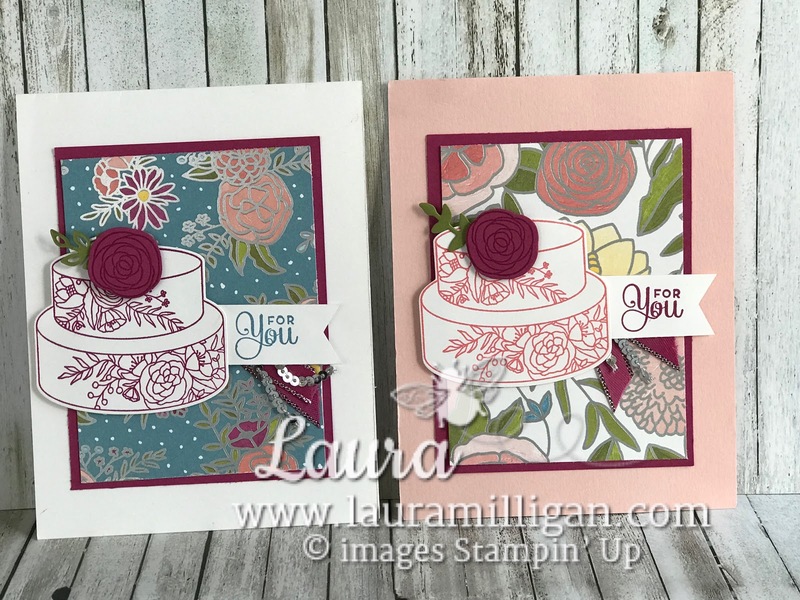 As a member of the Global Events Council, I was asked by Stampin' Up! to do a presentation on this suite at our November Onstage Live Convention. I fell in love with the products in this suite, and once I started creating with them, I couldn't stop! 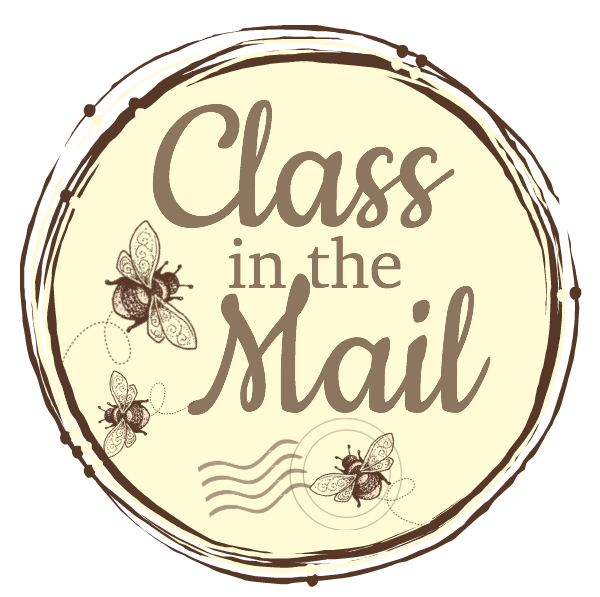 Here's a video made by Stampin' Up! that showcases the products in this suite. Just a note - I don't use the Stamp-a-ma-jig that she refers to at the beginning of the video - so if you aren't a fan, don't worry! I created some great projects without using it! This card features lots of products from the Sweet Soiree Product Suite - found on pages 10-13 of the Occasions Catalog - yes four pages! 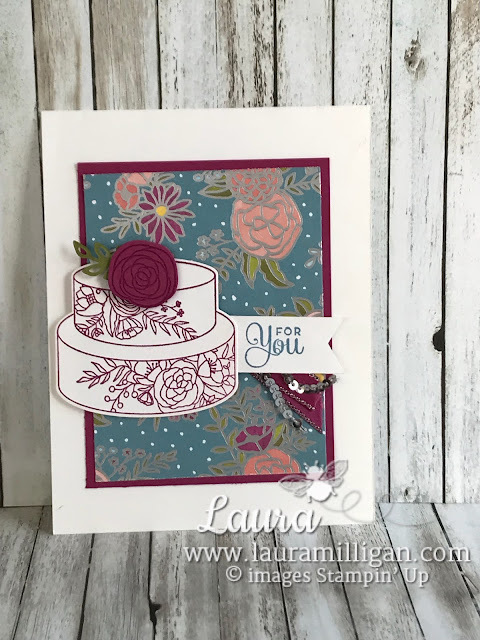 I started with a Whisper White thick cardstock base - and added a layer of Berry Burst cardstock. I used my formula for designer paper for the next layer - it's cut 3" across and 4" high -this allows 12 pieces of this size from just one 12 x 12 piece of designer series paper! I stamped the cake image and flower with Berry Burst ink - and cut the shapes out with the coordinating framelits. I want to mention that you get duplicates of the flower framelit and also one of the leaf shapes - which makes it so easy for cutting multiples! The little sprig of green is also cut using a framelit. 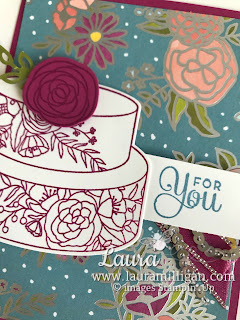 To finish the card, I stamped "for you" with Marina Mist ink and cropped the end to make a banner. I also added a little bit of the beautiful new Berry Burst Metallic Edge ribbon and a snippet of Silver Mini Sequin Trim. And here is the same card - I just switched up the designer paper, card base and ink. 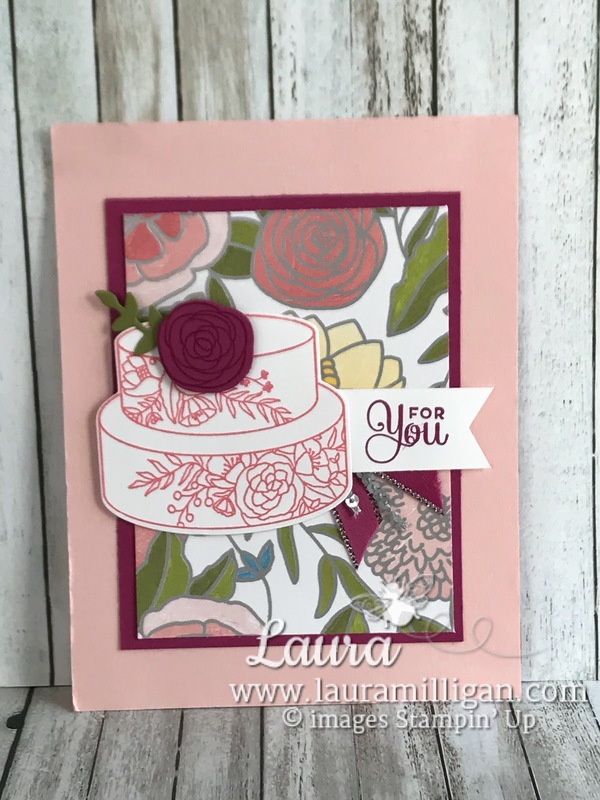 This card uses a base of Powder Pink, Flirty Flamingo ink for the cake, and Rich Razzleberry ink for the flower and word banner.